Many people feed songbirds so they can enjoy their beauty and their antics and help them survive winter. Some homeowners have also discovered that if they provide these birds nesting facilities as well as food, the birds return the favor by staying in the area during the growing season and taking over pest insect control duties in the yard. This section is designed to help you decide whether you wish to add some housing services for the songbird population in your yard. To see some examples of bird houses available in the garden centers and hardware stores Click Here to get to Yardener's Toolshed section on bird houses. IN YARDENER'S TOOL SHED WE OFFER A WHOLE RANGE OF BIRD HOUSES MOSTLY FOR EACH SPECIES. JUST CLICK HERE. As I watched yet another snowfall cover our gardens, I realized it is time to clean out the birdhouses we placed around the property. The best birdhouses allow you to remove the bottom or one side to clean out what's inside from last year. This reduces the chances of attracting mites and other insects that are harmful to songbirds. It may seem early to take on this task, but songbirds, like chickadees and nuthatches, like to get started very early in the spring. If you don't have any birdhouses mounted, now is the time to buy or make one or two (see "bird houses" in www.yardener.com). There are really only four species of songbird that you can expect to take up residence in your birdhouse, chickadees, nuthatches, titmice, and house wrens. All the other common songbirds use other modes of housing to raise their young. Bluebirds and purple martins use houses, but they are special in their design and location. But, you say, "I have tried putting out a birdhouse, and the sparrows or the starlings took it over preventing the cute little fuzzies from moving in." It is true, the English sparrow (house sparrow) and the starling are considered barbarians that should have stayed in Europe from where they came. But maybe we should be a little more tolerant of those two species that have a lousy reputation. In the first place, they can be a problem taking over your birdhouse in only one situation -- the hole in the birdhouse is too big. I've seen birdhouses for sale at garden centers with the entrance hole at 2 inches. In addition, many birdhouses are sold with a cute little perch below the hole, perfect for helping the starling and sparrow land and get into the house. The way to prevent sparrows and starlings from getting into the house is to make the hole no bigger than 1 inch in diameter and get rid of that perch. That is perfect for the four cuties we want to attract to our yard, but much too small for sparrows and starlings. 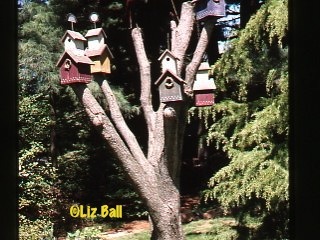 If you have a birdhouse with a hole that is too large, it is easy to fix the problem. Simply glue a piece of wood, 3/4 -inches thick or so, over the existing hole. Then drill a 1-inch hole through that block of wood, and goodbye sparrows and starlings. Just to be fair about this whole issue, sparrows and starlings are basically good guys in the yard and garden. Sparrows need to feed their young insects for the first few weeks, and with five or six broods, they considerably reduce your pest insect population. Starlings are the only bird that will eat a mature Japanese beetle and they are voracious chompers of white grubs just as they are about to surface from your lawn. Just some food for thought.